Visual Studio Express only has a subset of what you can find in Visual Studio Professional, which makes complete sense, but two missing features actually prevent users from following best programming practices in my opinion. The whole point of Express is to let enthusiasts and students discover the joys of programming – so we might as well let them do it the proper way. The first limitation is not being able to set an external executable as the “start action” when you debug. In Express, you can only run the debugger on an application project (console, UI, or web application). You can’t set a library project to be the startup project, nor can you attach the debugger to another process. This means that if you want to debug your unit tests, the unit test project must be an executable. Thankfully, most unit testing frameworks have a console bootstrapper that you can use as your console application’s main loop, but it’s not ideal, and it probably doesn’t incite many people into writing unit tests because they have to figure all this out. More importantly, it breaks down when you can’t create console applications at all, like when you develop with Silverlight (although .NET 4’s assembly compatibility with Silverlight 4 may make things smoother here). A way to get around that would be to use add-ins like TestDriven.NET, but Express also has a limitation that it doesn’t support add-ins (this actually got TestDriven.NET into some trouble at some point). Other ways to get around it would be to access Visual Studio’s command window, or drive it with VB macros, but Microsoft closed those “exploits” with Express 2008. The only way to get around those limitations is to use the .NET Framework’s CLR debugger, which ships with the SDK and is a stripped down version of the Visual Studio shell featuring only the debugging features. The problem is obviously that it’s a bare bones debugger that’s completely disconnected from the IDE experience. The CLR debugger is also the only way to get around the second of Express’ limitations… You’ve probably already encountered a program that does heavy processing on the UI thread instead of in the background, resulting in sluggish user interaction, progress report, and lack of a button for cancelling the operation. Well, it’s pretty difficult to implement it otherwise with Visual Studio Express, because it doesn’t support multi-thread debugging. Sure you can put breakpoints in code that will run on different threads, and it will break correctly, but you won’t be able to access the “Threads” debug window because there’s none. This means you won’t be able to look at what’s running at the same time, so it’s pretty useless… and it’s a shame because the framework makes it so easy to use thread pools and background workers and such. It seems critical to me that Microsoft add those missing features to Visual Studio Express as they expand the open-source .NET community with their own projects. It should be as easy as possible for anybody to participate – not just people with a $1200 MSDN subscription. But the reality is that most of those open-source projects aren’t usable on anything else than the Professional versions (which opens up another debate regarding the culture of the .NET community, but that’s for another time). Of course, people could still use other IDEs like SharpDevelop, but then what’s the point of having those Express editions? 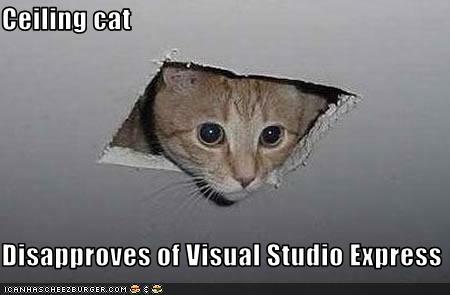 I’m sure Microsoft would be happy to keep all those students leaning on Windows and Visual Studio - as they should. So if Microsoft is committed to a free, functional and educational version of Visual Studio, I think they would have to fix the feature set appropriately.